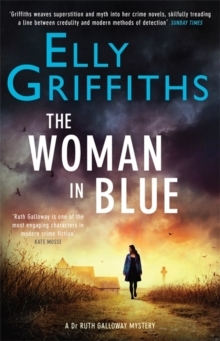 The Woman In Blue is Elly Griffiths' eighth mystery to feature archaeologist Ruth Galloway, local police detective Harry Nelson and their diverse, increasingly intertwined circles of colleagues and friends. It's no secret that I'm a huge fan of this series of books: as I've said before, they're tremendous fun as well as being remarkably immersive. Ruth is probably my favourite contemporary crime fiction protagonist, her odd relationship with Nelson continues to be fascinatingly complicated, and the supporting characters are all pleasingly three-dimensional. I also like the way Griffiths uses the setting of the books - the windswept marshlands of the Norfolk coast - not only to add atmosphere but also often to play an integral role in the plot. The Woman In Blue didn't disappoint. There's actually less of the landscape than there is in the previous Ruth Galloway books, and Ruth's services as a forensic archaeologist, which are central to most of the previous books, aren't called for here. That means there's perhaps more of a police procedural feel about this book, but the murder investigation at its heart still involves plenty of delving into the past and Ruth is still closely involved in the action. It begins with the death of a beautiful young model near the Shrine of Our Lady of Walsingham, famed for apparitions of the Virgin Mary and a place of pilgrimage for Catholics and Anglicans alike. When a second woman dies, it appears Norfolk might have a serial killer at large - and meanwhile, someone is sending threatening, misogynistic letters to women priests, including Ruth's old friend Hilary. Although I did miss the importance of the natural landscape in this book, Elly Griffiths does an excellent job of evoking the unique oddness of centres of religious pilgrimage. While there are all the commercial trappings you'll be familiar with if you've ever visited such a place - plastic rosaries and Blessed Virgin fridge magnets are certainly easy to come by - there's also a strange, rather eerie atmosphere of long-established sanctity and mysticism to which atheist Ruth, druid Cathbad and lapsed Catholic Nelson all find themselves unsettlingly susceptible. Religious fervour, guilt in all its many forms and long-held resentments are recurring themes, both inside and and outside the murder investigation. I felt the whodunnit plot in this book was actually a little more more plausible than its predecessors (not that I didn't enjoy their eccentricity), and everything builds gradually towards a gripping, fast-paced climax (Griffiths is excellent at these) during Walsingham's Easter passion play. I might have liked a little more in-depth exploration of the killer's motive, but this is a minor quibble. Running in parallel to the main plot is, as always, the unanswered question of what will happen in the uneasy relationship between Ruth and Nelson. I've said before that the Ruth/Nelson set-up is one of only a very few long-running 'will-they-won't-they' situations in fiction that I don't find rather irritating, and this remains the case - although things will surely need to resolve themselves somehow, or at least change over time, if the series is to go on. Despite the inherent darkness of the crimes at the heart of The Woman In Blue, and the soul-searching Ruth and Nelson both find themselves having to undertake in their personal lives, there is still plenty of the dry, perceptive humour that is one of the series' biggest strengths. Along with the perfectly realised cast of recurring characters, major and minor, it really helps these books to stand out from the crowd.